Cleaning your screen is now a breeze with the new Pop 'N Lock™ screen from Fan-Tastic Vent! 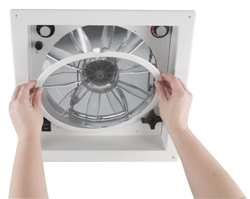 Easily pops into your existing Fan-Tastic Fan – no tools or screws needed! Screen covers the screw holes. 2/box. We offer the best so you worry less with higher quality and better performance that outlast all other brands. We carry all the accessories and hardware needed to make installation easier and more productive.